Basically, I gathered up all the supplies that I would put together in a “quiet bag” that I might bring to church with me if I had a preschooler or 8-year-old sitting alongside me in the pew for an entire worship service. What if we made such bags available to children to pick up before they entered our worship spaces? What if some of these objects were put into a “home box” and given to families for their use in at home or in the car? Cloth bags can be decorated with your church’s logo or each child’s name to use week after week. These can be placed in a basket in the narthex, on a low child’s coat rack (reachable for young children), or in a low book rack, such as used in nursery schools. The book rack can have a variety of children’s literature, picture books, and bibles on them for borrowing – in the pew or for home. 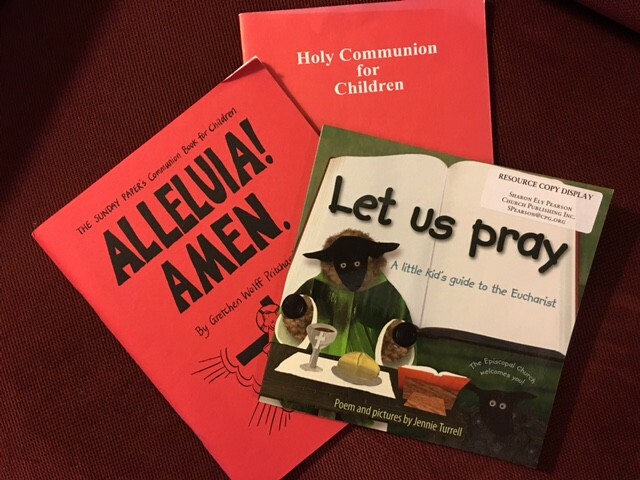 Books for parents can also be placed there, such as Anne Kitch’s The Anglican Family Prayer Book, Wendy Claire Barrie’s forthcoming book Faith at Home: A Handbook for Cautiously Christian Parents, or any number of booklets from Candle Press. where did you purchase The Communion Cube?